Congrats to Fuji's Pat Cunnane who won the Philly Commuter Challenge. Click on link for full story. KEELUNG, Taiwan (BRAIN)—After a long day dodging heavy trucks, cars and scooters, the A-Team rolled through a half-dozen tunnels into Keelung, Taiwan’s second largest seaport, after 10 days of pedaling around the island. RALEIGH, NC (BRAIN)—Edwin Flythe, founder of Flythe Cyclery in North Carolina, died last week. He was 94. Flythe retired in the early 1970s, turning the business over to his son, Skip Flythe. Today, Flythe Cyclery is a fourth generation family business. WESTPORT, CT (BRAIN)—Sales at Fox Racing Shox jumped 47.5 percent in the first quarter of 2008, although the company posted an operation loss of $198,000. IMBA's Mark Eller welcomed into the world last week, Sam Eller. Sam weighed in at a stout 8 pounds, 3 ounces. "He's looking forward to his first epic singletrack rides, but for now he's concentrating on eating, pooping and sleeping," said the proud papa. JHIHBEN, Taiwan (BRAIN)—Voxa “Vincent” Chen is president of Liow Ko, a company most U.S. retailers have never heard of. But Chen’s company, founded by his father in 1965, has made and finished parts for some of the industry’s best known brands including Specialized, Trek, Giant, Easton and others. TAICHUNG, Taiwan (BRAIN)—Topeak has inked an exclusive distribution deal with Norco Products for the Canadian market. As of September 1, Norco will distribute the complete line of Topeak accessories, Allay saddles (by Topeak) and Jango bicycles (by Topeak) to specialty bicycle retailers. VANCOUVER, British Colombia (BRAIN)—Bike Parks BC is offering two contest trips to start in July, the East Road Trip and the West Road Trip. Two lucky riders will be selected for each trip. BRAIN wishes you and yours a happy Bike-to-Work Week, so get out there and ride!!! Photo by JN: BRAIN editor Megan Tompkins (left) and BRAIN reporter Nicole Formosa (sporting her Evomo 3-D glasses) at the top of Meadows Trail overlooking Laguna Beach this past Friday afternoon. NEWBURY PARK, CA (BRAIN)—Giant Bicycle has announced the departure of Kevin Cox. 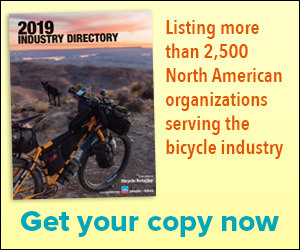 PHILDELPHIA, PA (BRAIN)—The Bicycle Product Suppliers Association (BPSA) reports that dollar sales of its members to dealers were down 10 percent compared with the same quarter last year. Unit shipments were down 18 percent over the same period. EUGENE, OR (BRAIN)—Burley Design has partnered with Hans Johnsen Company for the distribution of Burley trailers and accessories. With the Burley-Hans Johnsen partnership, independent bicycle dealers in the heartland will have greater access to Burley products. ELUANBI LIGHTHOUSE, Taiwan (BRAIN)—A last minute decision to add a few extra kilometers to Thursday’s Tour de Taiwan ended at this historic lighthouse late in the afternoon—signaling that this 1,000 kilometer trek is half over. LAGUNA NIGUEL, CA (BRAIN)—Lifeboat Solutions, an event management, sales/marketing consulting company for the recreation and sporting goods industry, has been hired by Safe Bicycling Innovations, creators of a new yet-to-be launched bicycle lighting system. SAN RAFAEL, CA (BRAIN)—While attending this year's Sea Otter, Trips for Kids (TFK) made a profit selling surplus merchandise from the Re-Cyclery Bike Thrift Shop and met up with the bicycle industry to raise awareness of TFK programs. Most components companies in Taiwan are relatively small affairs. VP Components’ Victor Lin, who founded the company in 1981, now oversees 1,450 employees, some 350 of whom are in Taiwan. Daisuke Kobayashi is the venerable manager of a venerable company. He oversees components maker SR Suntour, one of the oldest names in the business.